I did a little Q&A recently about what it's like working at Twitter. They published the piece this week but included only my answers, not the questions, which makes it read a little incoherently. I thought I'd put the Qs as well as the As here for the record. If you could describe the essence of Twitter's culture in one word, what would that be? Explain. Open. We're open in the sense that we have transparent internal communication and discussion. Open in the sense that the platform is open to all: from everyday individuals to news organizations to governments to entertainers and so on. Open in the sense that people at Twitter are always open to new ideas and perspectives. Open in the sense that Twitter employees Tweet freely and fearlessly about their lives and opinions. Describe your favorite part of the office/campus. The roof deck at Twitter is very special. It reminds us all that we're in the middle of a wonderful and vibrant city. Provides views of Twin Peaks and—often—the sunset. How would you describe the best day you ever had at Twitter? What made it so great? I've thought a lot about this. At Twitter I feel incredibly privileged to work at a company which makes a product that I so deeply love. I'm besotted with the thing which is Twitter, and that makes every day here special. If I had to choose one in particular, it'd be meeting Barack Obama at the White House while organizing the first ever presidential Twitter Q&A in 2011. Describe your workspace—what does your immediate (desk) and/or surrounding work area look like? Have you done anything to customize it? It's pretty minimalist. A laptop stand and 27" Dell monitor, wireless keyboard, wireless mouse. 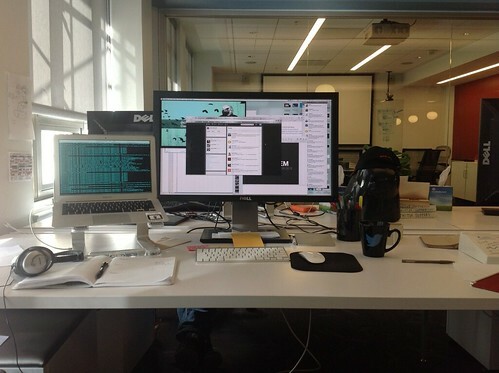 I've been at Twitter coming up for three years and have had 13 different desks since I've been here. I travel light. How would you describe the quintessential Twitter employee? Describe one unique/goofy/crazy/weird/quirky thing your team does for a little fun. The work in the Twitter Media team is unique and crazy enough on its own! Every week team members are meeting and hosting visits from heads of state, world-famous athletes, mega-star musicians, religious leaders, award-winning journalists, best-selling authors and media companies. We work with them to help them use Twitter ever more effectively to connect with their fans and followers, and to create unique interactive experiences on and off the platform. If there was one thing you could describe to an outsider to make them feel like a Twitter insider, what would that be? There's an incredible unity of purpose here at Twitter: every Twitter employee works here because they want to make Twitter the best it can be. From making the site faster to improving search algorithms, from testing new features with users to making sure our office feels like home, everyone is working passionately toward a common goal, eagerly looking toward the future and constantly amazed by the creativity of our users. Absolutely love Twitter (and the coffee mug on your desk haha). What I hate is that I own mainee.com and can't get the @mainee handle, even though it's not really in use. Very frustrating.